← For Fun: Barnaby’s Surprise Birthday Party 2011! Q: What food do you think you can prepare particularly well? Kotetsu: Fried rice! The great thing about it is that it can be made with whatever’s in the refrigerator. 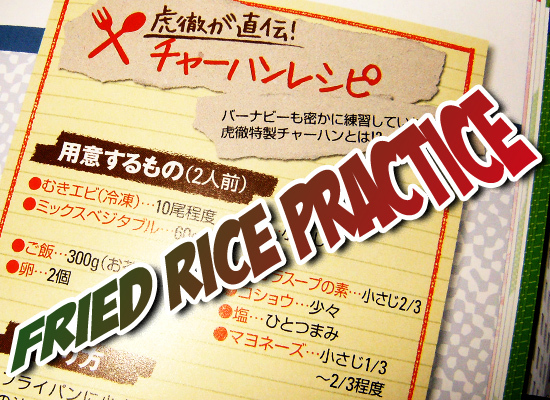 Hero Gossips has the official recipe for Kotetsu’s fried rice – in reality it’s totally basic. Heat up the frying pan, put in 1 teaspoon of oil. Add the frozen shrimp and fry them. When the shrimp has changed colour, add first the mixed vegetables and then stir in the chicken stock powder. When the vegetables are thoroughly heated, add mayonnaise and mix well. Remove the mixture from the frying pan. Using the same frying pan, put in 1 teaspoon of oil and scramble the eggs. Add the rice and heat up well until the rice is so hot it’s popping on the pan. Return the shrimp and vegetable mix back to the pan, and stir in with the rice. Adjust the flavour with salt and pepper. The chicken stock powder used in the recipe is most likely of the Japanese Ajinomoto brand, made of real chicken (their FAQ recommends using it for fried rice). I discovered that there are huge variations in what stuff they put into chicken stock powder in different countries, and it may be difficult to even find in some of them. In my country it’s mostly sold to catering services, in bags weighing several kilos. So I’m using soy sauce as a replacement, but be careful with how much you use it since it’s so salty (chicken stock powder is pretty salty, too). I’d let the shrimp thaw a bit before putting them into the pan. Frozen shrimp is usually glazed in ice, so it may sputter if you toss it in with heated oil. A really good fried rice recipe (it came out totally delicious) that I used for the event cooking suggested to cook the rice a day in advance, or at least let it cool off properly and sit in a fridge for a few hours before using it for fried rice. The result is less soggy that way. I tried making fried rice with both non-sticky rice and sushi rice and I think sushi rice came out with better consistency and texture – taste was good in either case. Japanese cooking recipes use metric scale, just like European ones. Thanks to fatcrow for the help converting some of the measures to American scale. Hero Gossips got a reprint in October, so check your usual buyfagging places for it! It makes things a bit more complicated since you have to dilute the goddamn thing into hot water. And I wouldn’t recommend using the whole cube either because it’s damn salty. Too salty. My life has a meaning and a purpose again. Thanks for the tip! Think you got lucky, they list Gossips as SOLD OUT now, lol. I’ll have to try this recipe out. 😀 Although I must say that I’ve never heard of adding the mayonnaise during the cooking phase before, haha. You can get chicken stock powder here in my country but the one I usually buy isn’t made from real chicken. Just curious, does the writing near the top say something along the lines of “Is Barnaby also secretly practising making Kotetsu’s special fried rice?” My Japanese isn’t particularly good so I’m not sure. Gonna have to try this to compare with my recipes.